Lime sludge dug up in Fort Myers could be dumped in Polk County and inside the sludge is arsenic. That’s why nearly 30 angry residents showed up to the county commission meeting Tuesday to express their fears with bringing the material to the area. The Department of Environmental Protection was also at the meeting to present the facts to the board. Among those facts, the DEP says the limestone sludge, which contains arsenic and other waste, is not toxic and doesn’t reach such a level to call it hazardous either. 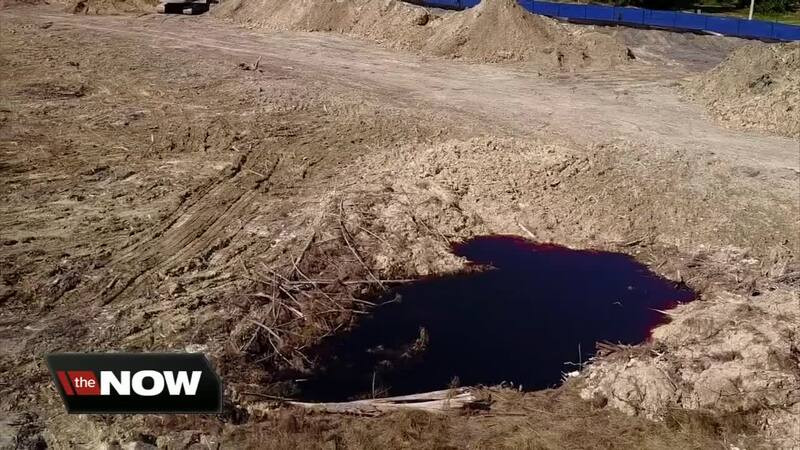 But because it does contain chemicals, city council members in Fort Myers said they wanted to clean up the wet mess for their residents, spending about $1 million to clean up the lime sludge and another $3 million to transport the estimated 30,000 tons of liquid. Once in Mulberry, Clark Environmentals told the county commissioners that the sludge would be laid out over concrete and mixed with sawdust to dry out. Once it is diluted then it would be transported to the Cedar Trail Landfill in Bartow. That’s the issue many of the residents living across from the landfill have a problem with. “I don’t care how safe they say this is, I don’t feel comfortable being that close to it,” Venessa Glass, a mother and nurse said. She knows what arsenic can do to the body and doesn’t trust the chemical being that close to her neighborhood. “My concerns are the long term effects,” she said. Other neighbors are puzzled as to why Fort Myers doesn’t keep their problem in their own city instead of shipping it across state. “Their residents don’t want it, so why do they think we want it?” Lanette Ball, a Polk resident said. Commissioners Rick Wilson and Bill Braswell echoed the sentiment, questioning the DEP as to why Fort Myers couldn’t dilute and dump the sludge in their own area. That answer lies in the lack of facilities and large enough landfills to accommodate the 700+ truckload of sludge, according to the DEP. This is the third location Fort Myers has tried to send the sludge because of the public outcry. First, Citrus County threatened a lawsuit if the waste product was brought there, even though Polk County attorney, Michael Craig, said Polk County wouldn’t have the grounds to do so. Then, an Alabama cement plant also turned down the offer. The DEP says this is not the last option for the sludge but that citizens don’t have anything to worry about. Experts say testing concluded the sludge isn’t toxic or hazardous because the level of arsenic is low. That’s why John Fus, who also lives near the Cedar Trail Landfill, says the move wouldn’t bother him. “The levels are barely above the levels for safe drinking water so somebody is blowing this out of proportion and making a big deal out of something that really shouldn’t be,” Fus said. But a majority of the residents say safe or not, they do not want it in their backyards.